CUESA’s Volunteer of the Month program recognizes the dedication and work of some of our most active volunteers. CUESA relies on volunteers to help with education programs, special events, public outreach, and other activities that help fulfill our mission to cultivate a sustainable food system. Learn more about volunteering and submit an application here. Join us at our next intern orientation on September 5, 2018 at the Ferry Building. 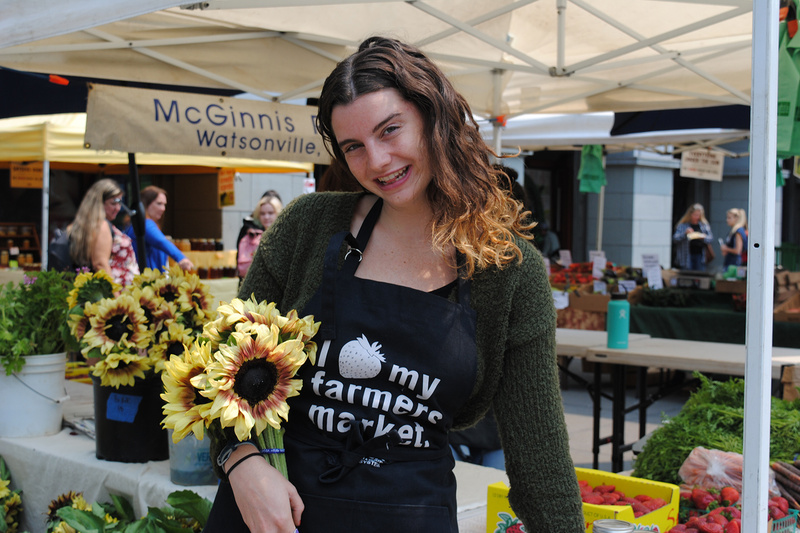 Immediately after a semester abroad with a focus on food security, Education Intern Reilly Lloynd helped CUESA launch the Food Shed at Jack London Square Farmers Market and the Mission Community Market, where she chatted with shoppers about biodiversity over bites of crispy lemon cucumbers. She also led hundreds of excited students visiting the market during our Foodwise Kids summer program. “Reilly was a great member of our education team this summer,” says Education Program Coordinator Tessa Kappe. “Emailing us first from India, she joined us on the heels of an international food sovereignty internship, from which she brought a valuable critical lens, passion and inspiration to her work with CUESA. We are grateful for her support and wish her the best of luck with her future endeavors!” Meet Lily and Reilly. Lily: Growing up in Michigan, some of my fondest memories are of picking wild berries during the summers, or helping tend to our small backyard garden. My family placed a lot of importance on what we put into our bodies. Those experiences encouraged me to study Environmental Studies and Economics and their intersection in order to prepare me to enter the world ready to change the food system for the better. Reilly: It comes from growing up on a farm and realizing only later in life that it is an immense privilege to have access and intimacy with your food source. Additionally I am extremely interested in food rescue as an avenue for better food distribution in a more democratized way. Lily: I explored San Francisco, which was unfamiliar to me, spent time with my sisters, hiked, or tried to cook something new! Reilly: You may have caught me baking pies for Three Babes Bakeshop this past summer in San Francisco. Now that I’m back to school in Boston, I am eager to apply my urban agriculture knowledge towards starting a super small produce plot on the rooftop of one of my college’s buildings. 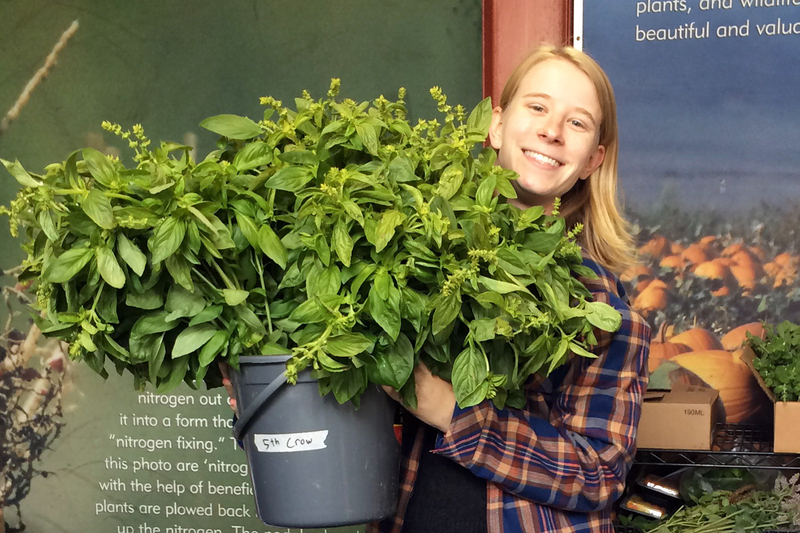 CUESA: What was your favorite part about interning with CUESA? Lily: All of the incredible people I have had the chance to meet and form relationships with and getting to see our work on the 25th Birthday Bash come together. Reilly: One of my most cherished parts of my internship with CUESA this past summer was something I learned from my supervisor about breadth and depth never having to be oppositional objectives but rather coalescing. What I mean by this is that in educating consumers about crop diversity, I learned a lot about the value of a wide reach versus going deep into a topic with only a few people. I was lucky to see many education insights like this time throughout my time with CUESA. Lily: The line for Reem’s is totally worth it. Reilly: My insider market tip would have to be oranges from Twin Girls Farm (more knowledge my supervisor Tessa blessed me with) for which you can get 10 pounds for only $8 on Tuesdays and Thursdays.